As you likely know, we here at IntoWindows love customizing Windows operating system. Over the years, we have reviewed hundreds of quality applications that let you customize Windows in one or other way. You can go through our 25 free customization tools for Windows 7 and 15 free customization utilities for Windows 8 guides to check out some of the best free tools available for Windows. 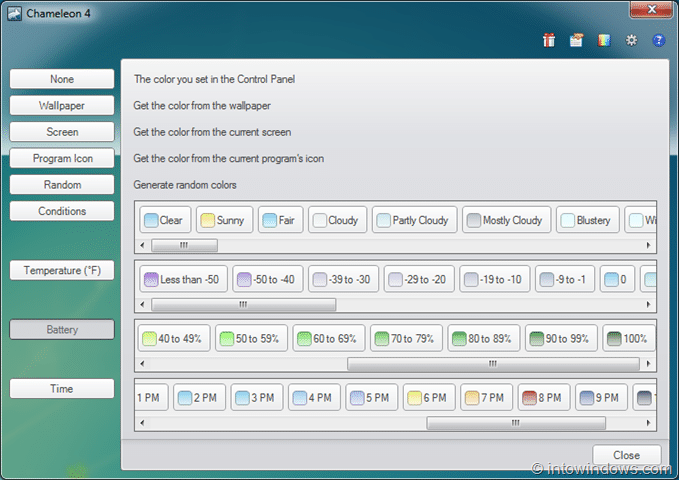 Chameleon 4.0 is a free utility designed to automatically change window color based on a few factors such as weather conditions, temperature, battery status of your laptop, or time of the day. In other words, it is capable of changing the taskbar and window color according to the time of the day, remaining battery percentage, and outside temperature. In addition to those factors, you can configure the software to get color from the current wallpaper (already available in Windows 8/8.1), use the color from current screen, get the color from the current program’s icon (active program), or generate random color. For instance, the tool automatically sets light-blue color as your window color when the outside temperature is 30 Fahrenheit and changes the color to red when the temperature increases to 90 Fahrenheit. You can either go with pre-defined colors or customize the default set of colors by clicking on a color button. You can even save customized colors by creating a theme file out of it. Please note that Chameleon 4 supports Vista or higher edition of Windows operating system only. So if you are on Windows XP, this is not the tool for you. Make sure that you have installed .Net Framework 4.0 before running this software. When the tool is running, you can see a Chameleon icon in the system tray area of the taskbar. Double-click on the icon to open the Control Panel of Chameleon. In order to change window color based on weather condition or temperature, you need to input your location name. To do so, open the Chameleon’s Control Panel by double-clicking on its icon in the tray, and then click on the small gear icon that appears upper-right of the window. Overall Chameleon 4.0 is an excellent program to automatically change window color in Windows Vista, Windows 7, and Windows 8/8.1 operating systems. However, I strongly feel that this tool is more useful for Vista and Windows 7 users as Aero is present in these versions of Windows by default. That said, it’s possible to enable Aero in Windows 8/8.1 using third-party tools. Note that the developer of the program has completely re-written the program and the newest version is very low on system resources as well. For those of you wondering, it’s portable software and can be used without installing the same. Ian, I provided Google Drive link as users need to visit DA first and then open Google Drive again to get the setup file. Anyways, just changed the link to deviantart gallery. Thanks for the feature! But can you change the download link to the deviant art page(deviantart.com/art/Chameleon-4-Download-468176134) instead of the direct download link so I can have all the comments on what people want for the program(bug reports/feature suggestions) and reply to them in one central place because I don’t go on this site very often and the google docs account no longer works.